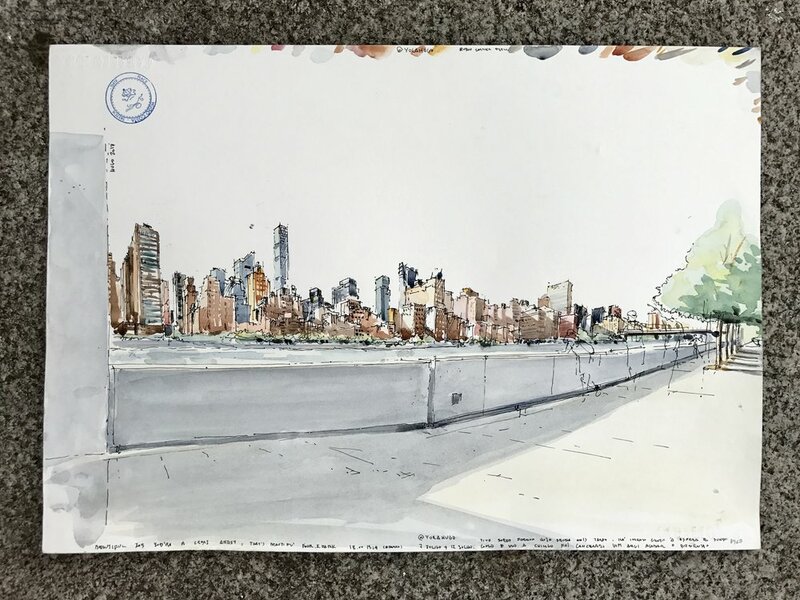 This year, Four Freedoms Park kicked off its inaugural “Sketch 4 Freedom” contest, inviting visitors of all skill levels to submit their sketches of Franklin D. Roosevelt Four Freedoms Park. The theme of our first contest was the “Four Freedoms,” in celebration of President Franklin D. Roosevelt’s pivotal 1941 address. Artists were encouraged to explore the meaning and legacy of the four freedoms – freedom of speech & expression, freedom of worship, freedom from want, and freedom from fear – and how those freedoms relate to art, expression, the built environment, and life in the 21st century more broadly. We received dozens of unique and beautiful entries and then our judges narrowed the field down to the top six entries. We left it up to you to declare the winner by public vote. After tallying the votes across all channels, we are thrilled to announce that Hugo Costa's "Walking on Freedom 3" is the winner of our first Sketch 4 Freedom Contest! Hugo will receive a $300 gift certificate to Blick Art Materials and a Four Freedoms Park swag bag. Please join us in congratulating Hugo on his terrific piece of art! Special thanks to all of our judges for their hard work and feedback and a very warm thank you to Richard Alomar of Urban Sketchers who organized four sketching meet-ups at the Park and helped shepherd this program. "I did Four drawings expressing one of Four freedoms - Freedom of Expression. They should be seen as a set of sketches that transmit how freely I let my instinct travel on the paths designed by Louis Kahn. At the end of this path, defined by stairs, walls, trees and shadows (so powerful!) I stood peacefully drawing Manhattan, framed in between these walls and shadows. I returned one other day to sketch the UN building, so physically and ideologically omnipresent at the Park." View the other finalists of the Sketch 4 Freedom Contest by clicking on an image below. Newer PostIntrepid Museum's Youth Leadership Institute Visits FDR Four Freedoms Park!